Let’s Kill Uncle by Rohan O’Grady ~ 1963. This edition: Bloomsbury Press, 2011. Softcover. ISBN: 978-1-60819-511-4. 279 pages. My rating: 7.5/10. Extra points for the creepy and darkly humorous plot, the very thoughtful and poignant musings of Sergeant Coulter, and the grand British Columbia Gulf Island setting, apparently based on the author’s visit to Saltspring Island. (I chuckled at the naming of Benares; shades of Ganges and Vesuvius on Saltspring!) Points off for the cardboard cutout characterizations of most of the characters. Points off for the occasional swearing, which, though mild, felt out-of-place, even if this story was aimed at an adult audience. Extra points for letting the cougar finally ultimately be a cougar, and for letting the villain be purely evil with no redeeming qualities! Far from a flawless effort, but I liked it much more than I didn’t. You’ll find lots of reviews on this one; its reissue by Bloomsbury a year ago brought it into high profile. This was a weird little book. I had read quite a few reviews before I ordered it, so I knew what to expect, but heaven help the innocent reader who thought they were picking up a mild children’s tale! Nothing innocent here; chock full of the darkest human flaws and emotions; the humour (of which there is a lot, all intentional) shades from gray to ebony black. The children meet on the ferry ride to the island; it is hate at first sight, but that doesn’t prevent them ganging up, running wild and wreaking havoc the entire trip. They are gratefully off-loaded, and the first person that makes an impression on them is the local Mountie, Sergeant Coulter. Luckily both children are struck with hero-worship at first sight, and Sergeant Coulter’s calming influence starts their personal transformations from brats to pleasant children. Turns out that Barnaby’s Uncle Sylvester is not the mild, mannerly and caring man he appears to be. He is a psychotic murderer with a long history of killing for pleasure and profit; Barnaby is pegged as his next victim, and soon Christie is doomed as well. The children are on to him, and unite to plot right back, deciding to strike first to save their lives. Uncle foils them at every turn. Enter a surprise ally, an outlaw cougar, One-Ear, livestock and child killer, who is hiding out in the underbrush. One-Ear tolerates the two children associating with him, sparing their annoying lives only because he can’t afford to draw attention to himself; the three end in working together to act as Nemesis to stop this wickedest of uncles. Nothing in this story is quite as expected; the ground continually shifts under our feet as we think we know what the author is going to have her characters do and say next; we often predict completely wrong. Sergeant Coulter is one of the most surprising characters. Initially he is a figure of fun, a slightly blustering, generally disregarded, musical-comedy type policeman. But the Sergeant has hidden depths. He writes long letters to his unaware (and happily married) love interest, rips them up and casts them on the waves. He has survived being a prisoner of war, and, in the novel’s very serious thread which runs through all the farcical nonsense of the murder plot, condemns the political forces that send young men away to kill and be killed, destroys innocent civilians, and allow the evil of the Jewish Holocaust to happen. A few incidents involving First Nations people, or, as 1963 lingo describes them, “Indians”, would likely not get past today’s politically correct censors. There are quite a number of parallel stories going on in this novel; the author competently intertwines them and brings them to their rightful conclusions. A highly moral tale, when all is said and done. Let’s Kill Uncle has a superficial feel of being a children’s story, and it definitely works on that level as a straightforward if morbidly fantastical adventure, but I finished with the strong feeling that the intended audience was very much the adults, and the message much more sophisticated than the plot description allows for. Bleak November, 1970. Michael Joseph, London, 1971. 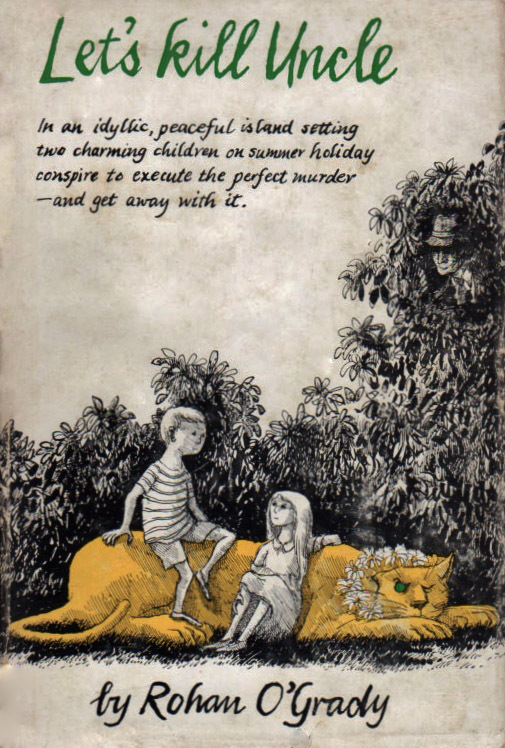 Edward Gorey illustrated Let’s Kill Uncle; I regret that the Bloomsbury reprint contains no art except for a rendition of the original cover on the title page. This is a very hard book to classify. 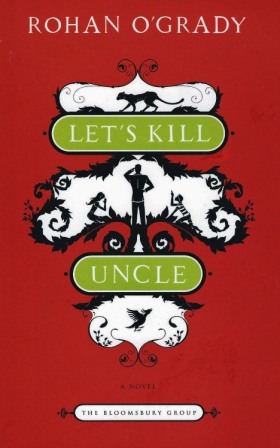 I’m trying to think of another similar book to compare it to; A Series of Unfortunate Events has been suggested as its natural successor, but Let’s Kill Uncle is a much more complex work than the contemporary Lemony Snicket series. I enjoyed this quick read; it will be even better the second time around. Recommended. I’ve had this sitting on my shelf ever since I pre-ordered it! Thanks for the reminder I have it! Must try to get ’round to it soon. Sounds delicious. I kept hearing about it, so I finally took steps to search it out. It was…interesting…! Hard to classify. But enjoyable – good summer read – and I’ve had a bit of time on Vancouver Island & the Gulf Islands so the setting was easy to imagine – lush rainforest hiding lurking cougars, and, in the solitude of those wonderful islands, lots of “individuals” living their lives as they choose. Oh, this one sounds marvellous! Thanks for reviewing it; I’ll be on the lookout for it.